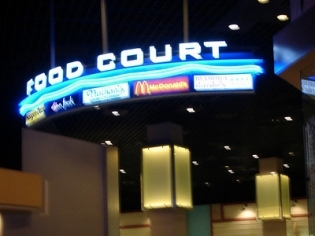 Every day, from early morning to midnight, the Luxor Food Court offers excellent meals or snacks at the ready. You’ll find delicious drinks at Starbucks Coffee, gourmet sandwiches at LA Subs, all-American, fresh burgers & fries at Johnny Rockets and traditional pizza as well as side items at Bonanno’s. Besides their popular signature item, Nathan’s Famous Hot Dogs also offers burgers, cheesesteaks, chicken and fish. Every day, from early morning to midnight, the Luxor Food Court offers excellent meals or snacks at the ready. You’ll find delicious drinks at Starbucks Coffee, gourmet sandwiches at LA Subs, all-American, fresh burgers & fries at Johnny Rockets and traditional pizza as well as side items at Bonanno’s. Besides their popular signature item, Nathan’s Famous Hot Dogs also offers burgers, cheesesteaks, chicken and fish. The Original Chicken Tender Company is a favorite for their tasty secret recipe batter and their brown sauce for dipping. Enjoy a freshly made order with fries to make a quick meal. This food court is the worst of any hotel on the strip!!!!! !